Yesterday I posted a recipe for matbucha, a Moroccan cooked tomato salad. When making this salad with fresh tomatoes (rather than canned), you want to use peeled tomatoes. After I posted the recipe, I suddenly thought I should post a little tutorial on how to peel tomatoes. You can’t exactly use a potato peeler, especially if they’re very ripe or soft. 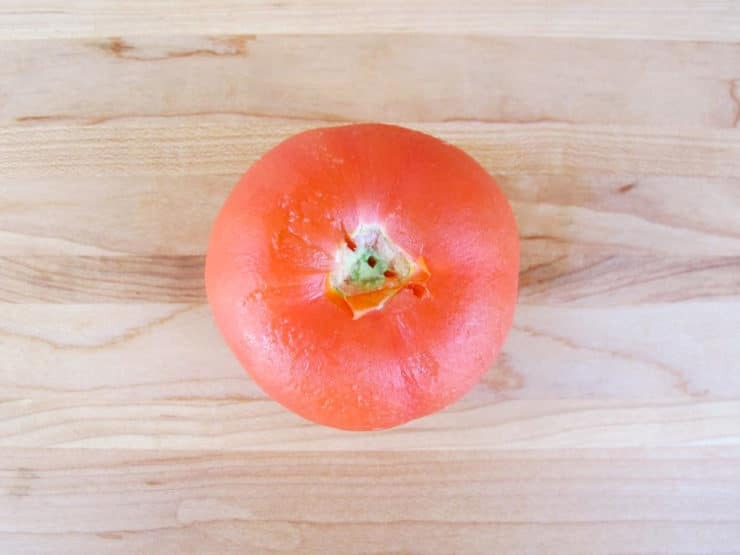 There are three easy ways to peel a tomato (that I know about), so I thought I’d write up a quick “how to” post. I’ve written the instructions and posted step-by-step photos below. With tomato season starting soon, it’s a helpful thing to know how to do. So, why peel a tomato? Tomato skins, when cooked slowly in liquid or sauce, tend to separate from the soft tomato flesh. This can create a stringy, unappealing texture in an otherwise lovely sauce. 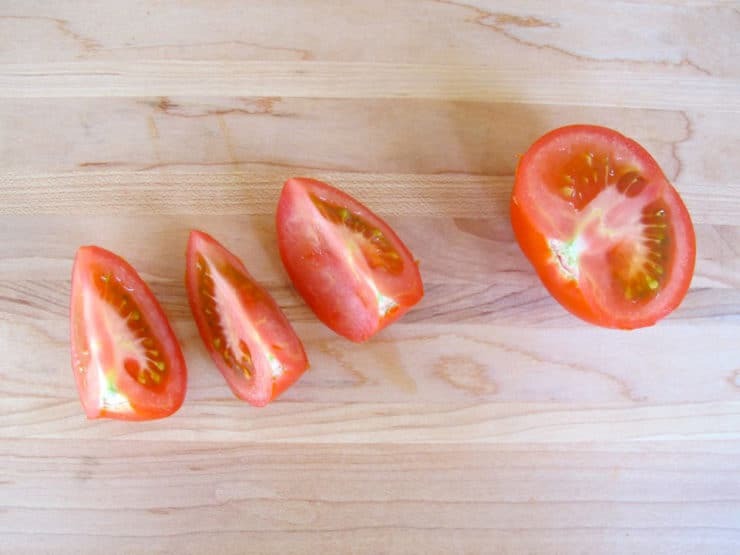 Here are three simple ways you can peel a tomato. All of them are easy-peasy and take less than a minute per tomato. Using a gas flame is the easiest way to peel tomatoes, in my opinion. It also produces the best results. You will need a gas stovetop and a fork. Remove any stems that are still attached to your tomatoes. Rinse the tomatoes clean and pat dry. Spear the tomato with a fork at the top, where the stem core is visible. Turn the stovetop flame to medium-high. Hold the tomato an inch over the flame, turning slowly, until the skin begins to split and blister. It should take about 15-25 seconds for the skin to loosen all the way around the tomato. Don't hold it over the flame too long or it will start to cook the tomato. 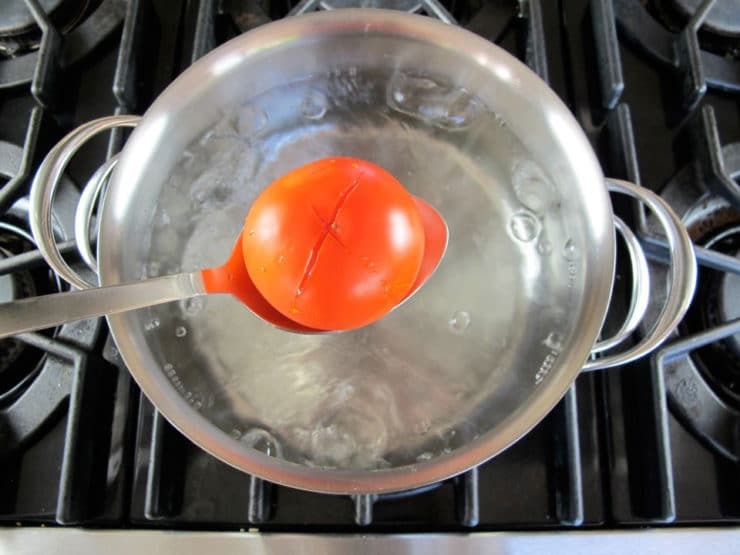 Place the tomato on a smooth surface and let it cool off enough for you to comfortably touch it. Begin peeling the skin where it split, making your way all around the tomato till all the skin is peeled off. 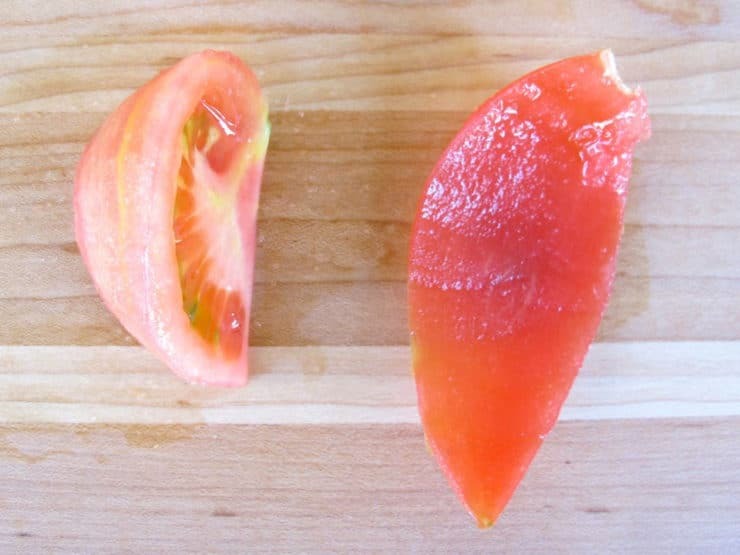 Using a sharp knife, slice a shallow X into the bottom of the tomato (opposite the stem side). Gently place the tomatoes into the boiling water. If you have several tomatoes, boil them in batches of 3-4 at a time. 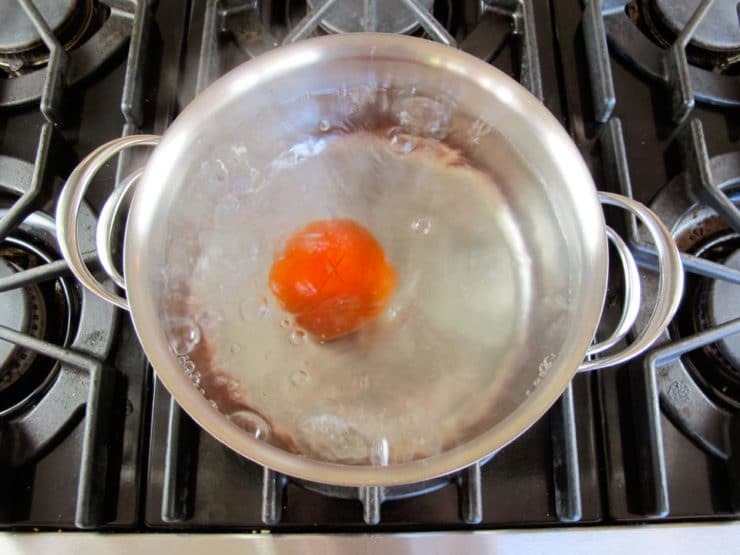 Boil the tomatoes until you see the X begin to split open wider, or for 25 seconds, whichever comes first. 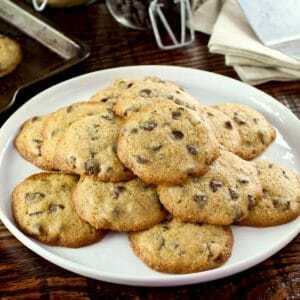 Do not boil them for longer than 25-30 seconds or they will begin to soften and cook. Remove the tomatoes from the ice water. Begin peeling the skin at the X, pulling the skin back gently. 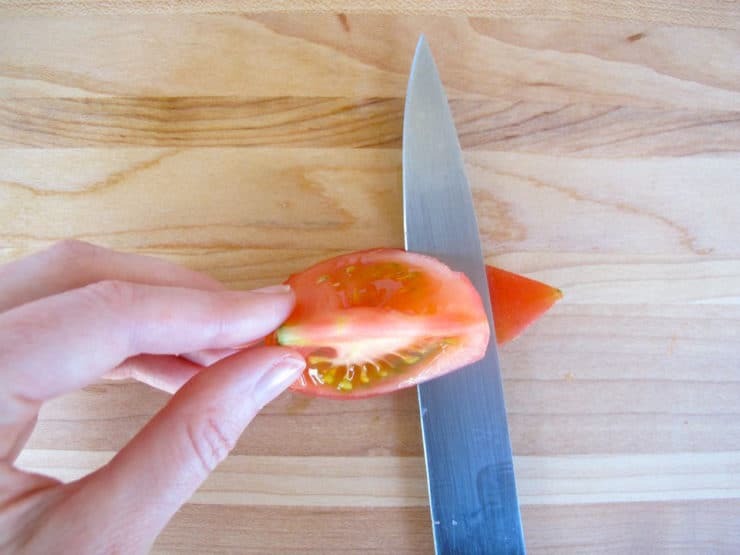 This is my least favorite method for peeling tomatoes because you can end up discarding some tomato flesh no matter how good you are with a knife. However, it's the only method that doesn't involve heating the tomatoes. I'm including it so you have all the options. Rinse your tomatoes and pat them dry. Slice the tomatoes into large wedges. Work with one tomato wedge at a time. Place a wedge on a cutting board, seed side facing up, skin side facing down. Press the tomato wedge firmly to the board to keep it stable. Using a sharp knife, starting at one tip of the wedge, slice the skin away from the tomato flesh. 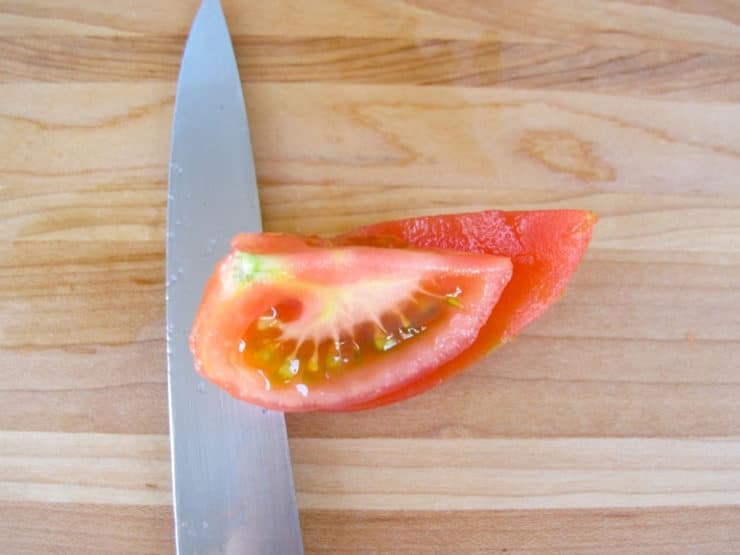 Keep the knife as close to the skin as possible, so you're slicing off the skin only and not slicing off the flesh of the tomato. Work your way from one tip of the tomato wedge to the other, until all the skin is removed from the wedge. Thank you, Tori. I am 68 yrs and learning to cook all over again since my husband was diagnosed with diverticulitis a few months ago and nearly had surgery. This is a tremendous help because he likes tomatoes and we raise a lot of them on our little farm. My stepdad went through diverticulitis. Not fun!! Hope he feels better now. Tori – My mother in law taught me another way to peel the tomaotes I wanted to share with you. You need only your clean and dry tomato and a paring knife. While holding the tomato, rub the blade of the paring knife over the skin of the tomato. Don’t cut through the skin, just rub the blade over it with the blade turned slightly to the side. The skin appears darker after rubbing the knife over it. After going over the entire tomato, break through the skin and the rest will peel off nicely! Great tip Susan, thank you for sharing! I used to throw the skins away, not anymore. 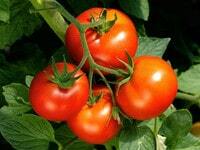 Tomato skins contain lycopene, it attacks free radicals in our bodies.. Instead, I drain the removed skins, place them on dehydrator trays, season with seasonings,and dehydrate til crisp. I then grind them, place the powder in glass jars. I use that all winter for soups, stews, stir fries, sandwiches, etc. Thanks for the tips on peeling tomatoes. Very helpful for a beginner. When making sauce I no longer peel or seed tomatoes. I just cook then, then break out the immersion blender. Works great. However, today I want to can whole plum tomatoes so I’m giving the hot and cold water a try. I’ve peeled tomatoes without the ice water but it seems to me that this way will work better. Then I’ll just stick the whole tomatoes into a quart canning jar and continue to march. #1 Freeze them. Boiling water dip… the skins just slide off. #2 Send them through a tomato press. Removes skin and seeds. Leaves a smooth pure. I oven roast then freeze tomatoes by the case load for the winter using this method. I used the boiling water method and it worked. I couldn’t believe how easy the pealing came off. It almost came off on its own. I am making a tomato consommé recipe which called for 20 peeled baby plum tomatoes! I was just about to kill myself when I came across Tori’s method. I tried the boiling water method and it worked like a dream – thanks Tori! All I would say is watch the timing depending on what size toms you are using; my baby plums only needed 10 seconds. Kidding aside, thank you for the tips. I’m going to peel a bunch to use in a sauce and this should save some time. I want to seed the tomatoes as well so I am going to try seeding some and then skinning and skinning followed by seeding on others to see which works the best. Either way, the kitchen is going to be smelling really good today. My Grandmother taught me by running the tomato under hot tap water for a bit, then using a sharp paring knife to poke under the skin and pull it away in strips. I haven’t tried the other methods yet, but hers still seems simple and efficient. All these methods are for Wimps!! I’ve found that the best, most-manly way is to obtain a cheap, used four-inch side grinder(I got mine at auction when a local body shop went out of business.) With a wire brush, get as much of the body putty or other grimy residue out of the grinding disc that was in the machine when you bought it. It is not necessary to buy a clean, new disc. In fact, it is considered frivolous, wasteful and unsporting. With grinder firmly in your right hand, run the grinder up to it’s maximum speed. Then with your left hand, slowly rotate the tomato, so that eventually, you should have very effectively removed all the skin. Do not do this while wearing a white shirt. I should have read Tom’s entire post. My Little White Dress is now a theater prop? I only have a 9-inch grinder – do you think that will be a problem? When you say removed ALL THE SKIN, you weren’t referring to your fingers! Lol, just kidding! great to find your tom peeling tips. I have over 60 Mortgage Lifter tomato plants reaching for the moon so will have a task making relish etc (gallons ???) when they fruit. These tomatoes can attain a weight of a kilo for one tomato. Thank you! We had heirloom tomatoes with lots of grooves that we wanted to peel. This was really helpful. We did Method 1 this time and it worked perfectly. We’ll try it over the flame next time for contrast! Besides the boiling method, couldn’t one also use a steamer? I have a boiler insert that I use for broccoli, cauliflower, etc. Seems like it would also work well for peeling tomatoes. Maybe I will try it. I’ll have to guess on the length of time needed. Mark, let us know if you try it! I found a website that suggested 3 minutes in a steamer. That’s versus 30 seconds to a minute in boiling water. In either case, you don’t want to overcook the tomatoes. I pull them out as soon as I see the skin split. 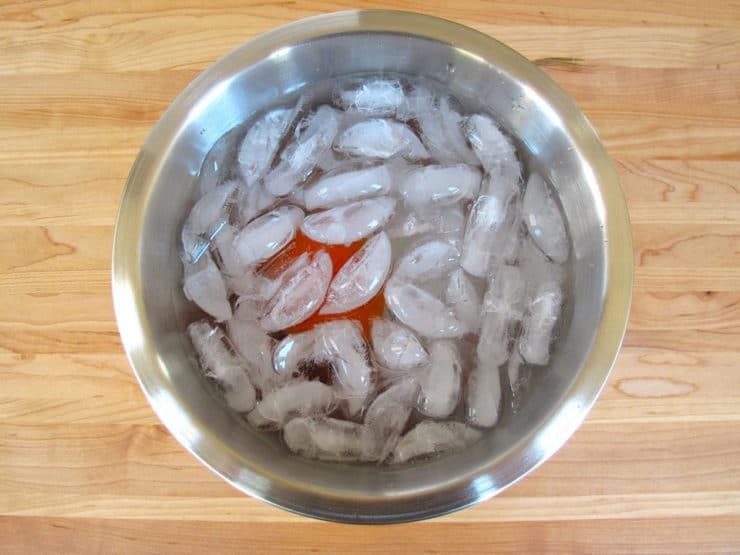 A secondary ice water bath is recommended regardless of whether you steam or boil. I make roasted tomatoes halves and although the original recipe does not call for the skins to be removed, there’s a sort of melt in your mouth texture when they’re peeled. you could always use a food mill. Bonnie, that works for purees and sauces, but certain recipes require whole peeled tomatoes. I appreciate all these ideas and have used most of them YET I would point out that if you are in a hurry to get you pot going for standard tomato sauce or other use which will be liquid in nature you can get by by NOT peeling them. I would admit you need to core them to remove the stems/cores then fill a blender with 40 percent of water by volume and then add your first tomato, I suggest cut in quarters, allowing the blender to grind up your tomato in the fluid. Once done add a second tomato and allow it to become fully ground into the liquid. By now your blender is probably pretty full so you must now pour off 60$% of the blender contents and then add the next two tomatoes and then pour off 60% of the liquid again.. repeat this process until all of your tomatoes are fully ground up into liquid adding water as needed to maintain a slurry. Now your sauce is own its way complete with those healthy wholesome skins.included. 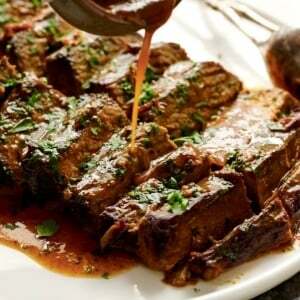 You will also find it takes less cooking time to get the sauce to a creamy texture for sauces. Now I will admit this technique does not work for any other tomato uses. I use the method my father taught me to peel tomatoes, the method his father taught him and his father before him so on and its probably many centuries old, lol get the misses to do it lol so simple. Flame method worked like a charm. . . though I am not sure why I need to remove the skin for my recipe!! After I peel them, can I put them back in the fridge? I am making dinner tomorrow but I want to get as much word done ahead of time. I am new at this and its for a date, so I do not want to end up bailing on the idea when it all goes wrong. Depends on what you’re making– if it’s for a sauce, it shouldn’t be a problem, as long as you keep them covered in an airtight Tupperware or something similar so they don’t dry out too much. If it’s only a day ahead, it should be ok. Good luck! Thanks so much for this tutorial! I really needed it last night. I tried using a knife & gave up. I can’t wait to try these methods! would like not to heat it! 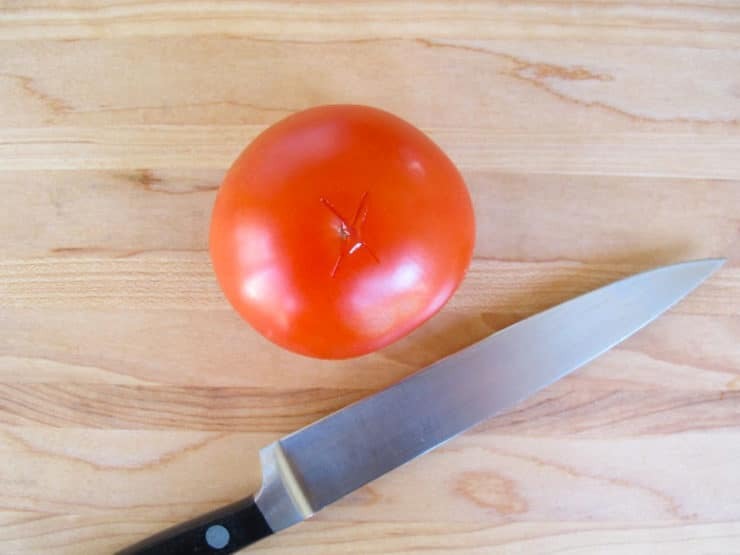 Put your knife with a short angle on the tomato, and rub it all over the tomato skin. Then slice a shallow X into the bottom of the tomato and start skining. Hey Hasan, Thanks for this tip. I definitely didn’t want to have to start messing around with boiling and ice water. These are great tips. I use and have used the boiling water method my grandmother taught me when I was ten. I am 75 now and have canned my husband’s garden produce for years. I am thankful to my grandmother for her teaching and love. Bless your grandma Leanora! I am grateful for the wisdom my grandparents shared with me, too. Great tips for a first timer like me! I did choose the ‘old-fashioned’ way as it reminds me of all of the great cooking secrets that I learned from my Grandma. I just finished peeling a dozen tomatoes in less than 10 minutes. Wahoo! Now to make that sauce I’ve been thinkin’ about. . . I will use the butter knife and bruising method. I am trying to stay away from the fluoridated municipal water supply and have yet to buy a RO filter for the kitchen so I am using distilled water for now. Very helpful article for those new to cooking. Helped me a lot. Thanks for the tip. I don’t like tomatoes at all, but my husband does and always wants them peeled. I’ve destroyed one too many tomatoes by trying to cut the skin off with a knife. Should have looked it up sooner! I have never had any luck with the boiling/ice water method. I always end up with only quarter or half peeled tomatoes. I’m definitely going to have to try the gas stove method as I have about 60 pounds of tomatoes to do! I just did a whole batch by using a coarse cheese grater (1/4 inch size). Slice the tomato in half down the core and rub against the grate. I used a rubber jar lid opener to hold the tomato and protect my hand. You get a nice puree without all the pots and pans. Thank you very much for this post! I had no idea what I was doing, and this made it uber easy. Nice. Halfway through peeling 30 tomatoes for my sauce, I found your suggestion during a break (to rest my hands). I used the gas stove method on the rest and found that I didn’t even need to wait for them to split — 30 seconds was fine. I turned each over the flame using the fork and left them on the counter to cool while I completed the others. They peeled like a charm. Used on: Big Boy, Lemon Boy, and Big Beefsteak tomatoes from my garden. Don’t you just love those little shortcuts? They make life in the kitchen soooo much easier! 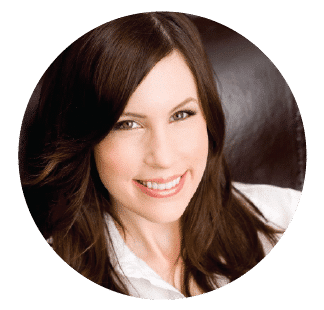 Ann – just tried your method, worked perfectly! 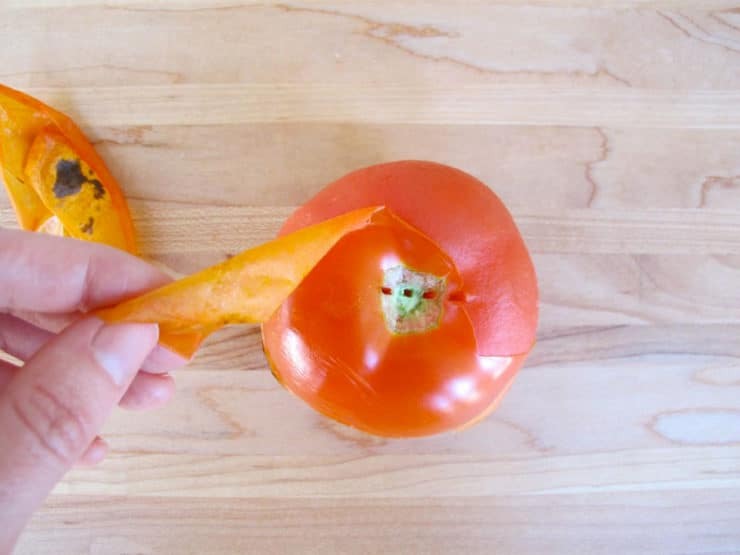 I use a SERRATED vegetable peeler on tomatoes all the time and have no trouble. The straight edged vegetable peeler doesn’t work anywhere near as well. Great tips! Last year we had so many fresh tomatoes from the garden that I ended up freezing them. They were super easy to peel for use in my tomato sauce. Just ran them under warm water and the skin came right off. Glad you mentioned this way. My mom did this. Just freeze whole skin on. Great for fall stews, chili, or to make your pasta sauces. If anyone knows about the freezing method, doe you remove stems first? 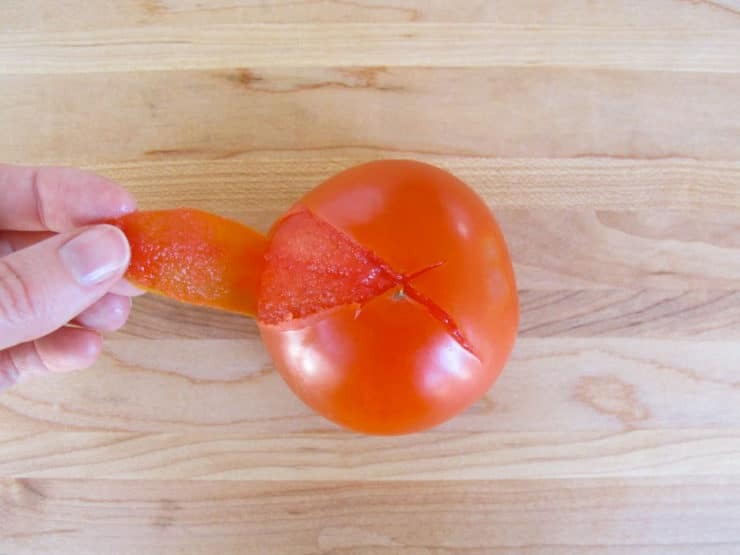 The way my mom taught me to peel a tomato is like this. 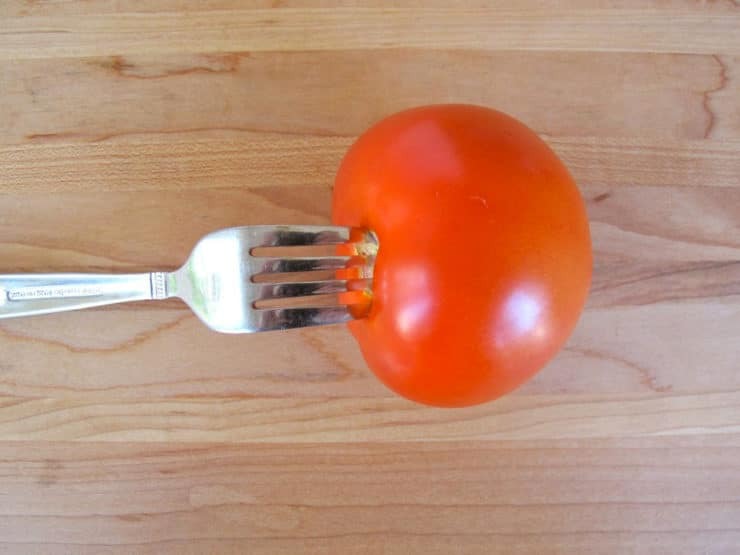 Hold your tomato in your left hand and with your right hand use the back side (the non cutting side) of a butter knife. 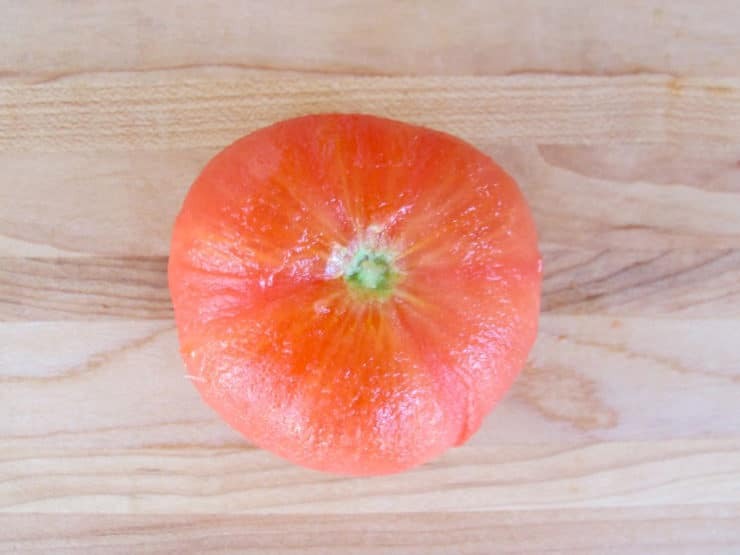 Go over the entire tomato “bruising” the tomato or scraping at the skin but not actually cutting it. When you’ve done the whole tomato use the tip of a sharp knife and lift a little bit of the skin. The skin should peel right off. If you get those mealy type of tomatoes this won’t work as well because the skin will take some of the flesh with it. 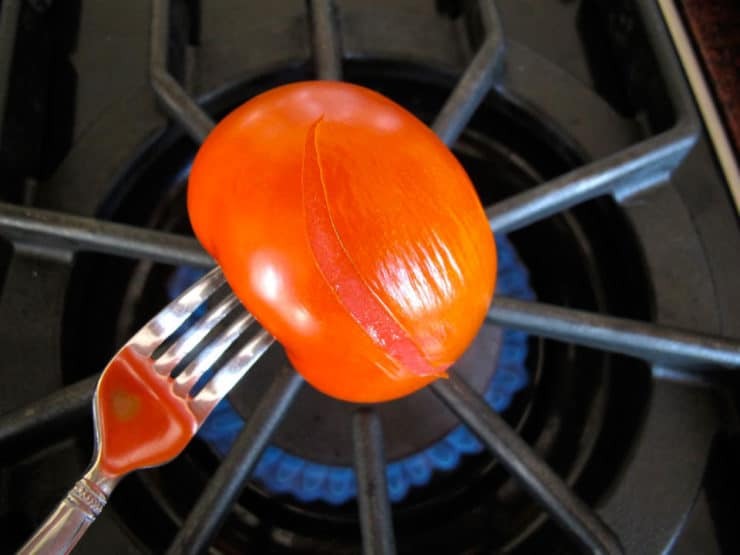 This is a great way if you don’t have a gas stove top and you just want to peel a tomato for a sandwich. Great tip Ann, thanks for sharing! That’s exactly the way a dear, old friend taught me to do it, too, about 40-45 years ago. She was Austrian, married over 60 years to an Italian man. I don’t remember if it was the way HER MOTHER or her mother-IN-LAW taught her to do it that way, but over 100 yrs. ago, this is how it was being done!